Life news interview with Givi on 3 Feb. 2017, after Ukrainian attack on Avdeevka was repelled, including by "Sparta" (Motorola) and "Somali" (Givi). 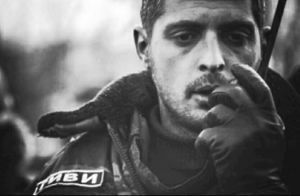 'Somali' lost several fighters and Givi was lightly wounded, but was back the next day. Givi says that Ukrainian side had higher losses and was resorting to shelling civilian areas; and that his side did not extend a counter-attack further as he was following Minsk agreements. Givi supported DPR leadership; had ascetic lifestyle. A video with his reaction to a Grad shell hitting nearby made him famous internationally. ...As well as him calling UAF commander on the phone to stop the shelling, Aug. 30, 2014. 8 Feb. 2017. Prominent commander of DPR "Somali" batallion Mikhail "Givi" Tolstykh is assassinated in his office, said to be by a shot from "Shmel' portable thermobaric rocket. DPR blamed Ukraine for the assassination. DPR investigators confirmed that IED is considered as a possibility. Cassad. Includes 'Legion' commander & DPR MP Sergei Zavdoveev discussing versions, IED or Shmel, IED a priority based on damage (window frames not (much) damaged, and not towards the inside) and injuries (looks more like a directed blast coming from a heater by the window); suspects it could be set by a new (double) recruit. Photos of office location here. 9 Feb. 2017 Givi funeral photo, video report report, many thousands, and Zakharchenko attending in central Donetsk. This page was last edited on 12 February 2017, at 14:12.